The aftermath of the collision between a truck and a car in which British man James William McGrory, aged 59, was killed. Photograph by Bayan Patroller Junifer Liwag. A British man has died after his car was in collision with a truck in Davao City. James William McGrory, aged 59, was declared dead at the scene of the crash in Marilog district, at about 3pm yesterday (Tuesday, April 4). Details of the collision remain unclear, but local police told GMA-News that the driver of the dump truck, Brendo Dablo, may have steered into oncoming traffic, causing a head-on collision. The truck driver is now being held at Marilog Police Station under suspicion of ‘reckless imprudence resulting in homicide’ and damage to property. Mr McGrory’s remains were taken to the Angel Funeral Homes in Calinin. It has not been confirmed whether the victim was a permanent resident of the Philippines, or a visitor. Investigations into the collision are continuing. 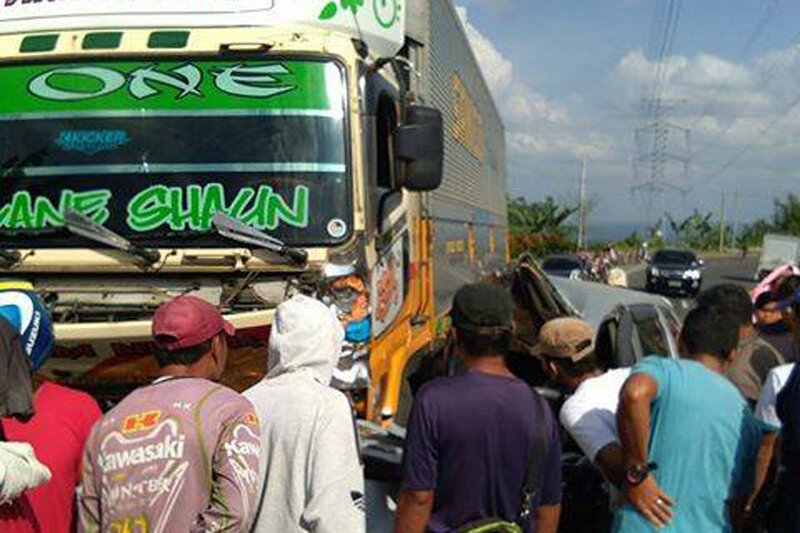 The collision is just the latest deadly accident involving heavy vehicles on Philippine roads. On Wednesday last week (March 29) we reported how seven people were killed and four injured when a truck loaded with sugarcane crashed into a roadside restaurant in the Batangas town of Taal. Eyewitnesses described how the vehicle was hit by another truck, causing it to skid and plough into the eatery where the victims were eating breakfast. In October, we reported on another fatal crash involving a runaway truck. Five people were killed and 14 injured when it lost its brakes and ploughed into heavy traffic in Quezon City. The 22-wheeler was carrying 60 tons of metal – 40 tons over its official capacity – when its brakes failed and it smashed into five vehicles. Trucks and all public utility vehicles should have an annual safety check, not just emissions. Also the drivers should undergo a driving test every 3 years to display competency in handling. The majority of trucks are second hand imports from China. They were waste there, brought in Philippines with slight repairs and considered road worthy. They are usually overload and ill maintained. Their maintenance is as good as it can run on the street transporting cargo. Safety features are non existing. Drivers do have professional licenses, almost all of them would not pass not even the student drivers test in a western country. Pressure from owners is increased since they have to deliver as fast as possible and then to the next trip. Their salary is commissioned as such too. It is a miracle and a huge effort from these drivers that there are not way much more accidents. My name is dougie borland. I am Mr McGrory brother in law. We have been notified today by the local Scottish police about accident. Unfortunately Liam was visiting his girlfriend in the Philippines and we are now unable to contact her family. They had met on the internet and we know nothing of her or her family. We are distraught over here as we have limited information. We are unable to contact her family at present. If anyone has any information on how we could possibly do this, then please contact me ASAP. Please contact me and give us information. I think her girlfriend also in a hospital in Davao, Philippines spmc. Hi Sir, already sent via email the contact number of Maam Linda Mainit, she’s the mother of the girlfriend of your brother in law. Has the British Embassy offered any help? Can I just say a big thank you to all the people in the phillipines who have emailed me and given information. On behalf of my brother in law Liam and his family, thank you very much for all your help. I no realise why he loved your country so much.